The Ski season at Stratton was sabotaged by summer coming a month early. The US Freestyle Championships were held at Stratton Mountain March 21 to 25, even with the warm weather. Stratton trucked snow to trails and held an amazing event! Many of our customers and clients have all commented on what a great job Stratton did in providing great snow and skiing given the lack of snow. Buyers have not been daunted by this strange year. Our office, alone, put 7 properties under contract. Condo's seem to be the most popular. There are still some great buys to be had and Vermont is a great place for family vacations in the summer. Cute vacation home w/pond $169,000 . Pearl Buck Drive: Spectacular views across the Winhall Valley to Bromley from windows of this beautifully built and well designed home. A spacious living room with wood floors, beams, wood burning FP. . The Kitchen is designed for cooking with a 6 burner gas range, double ovens, and 2 dishwashers. Master bedroom is on the main level with three additional bedrooms and baths on the second. The lower level is spacious with a family room with FP, hot tub room and additional room for a pool table etc. $999,999. Prices are still at a low so it is a great time to buy. Mud season has passed so drive up and have a good look at our area. Located in the Golden Triangle area of Winhall,this cute chalet has 4 bedrooms and two baths. 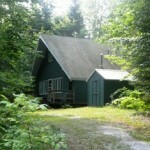 It is conveniently sited between Stratton and Bromley Ski areas. It is on 1 acre and has a pretty pond. Priced to sell t $169,000. Piper Ridge Condo at Stratton. Beautifully updated Piper Ridge $350.000.